We are having fun learning about stories from around the world. At the moment we are hearing lots about the story of Daedalus and Icarus from Greece. We learned that Icarus didn't listen to his Dad and he flew too close to the sun. This caused the wax on the wings he made to melt, and he fell into the sea. 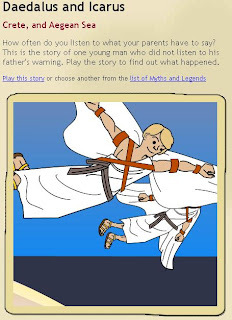 We love the legend of Daedalus and Icarus.